This month I joined another cooking challenge group: Recipes to Rival. Each month the group chooses a different savory recipe and cooks it together and post our results. The recipes are ones that should “increase our repertoire of cooking skills”. The challenge recipe for November is one from the last season of Bravo’s Top Chef. It’s the squash soup recipe created by Andrew & Spike for the Improv challenge. In this challenge the chefs had to create a recipe based on 3 words supplied to them by the audience at Second City Comedy Club. The 3 words that Spike & Andrew’s team had were: Yellow, Vanilla, and Love. They decided to make Squash Soup with Vanilla Crème Fraiche. I enjoyed making this soup and spaced out the process over a couple of days—making the veggie stock one day and then doing the remaining steps the next day. The resultant soup was very flavorful and decadent. I can see how it helped Andrew and Spike do so well in the Top Chef challenge. 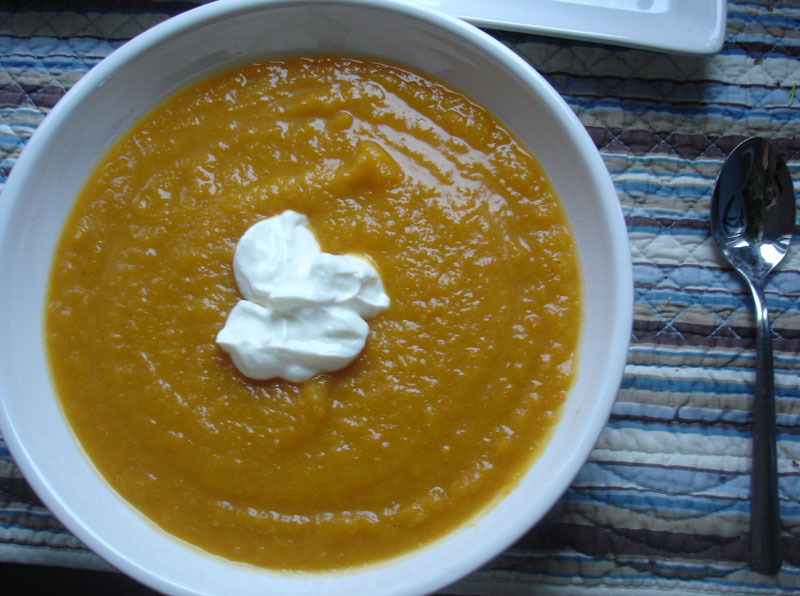 I am not the biggest squash soup fan in general, so I am not sure if I will make this recipe again, but I am glad I did for this challenge. The hosts of this month’s challenge are Meg or Joy Through Cooking and Lori of Lori’s Lipsmacking Goodness. The official Recipes to Rival post for this challenge is located here. Make your own stock. You can use the recipe given or play with the flavors. The given stock is a vegetable one. If you want to go with a chicken stock you are welcome to, but it must be homemade. This part can be done ahead. Incorporate a creamy vanilla element. You can use whipping cream if crème fraiche is cost-prohibitive. For those with allergies/food restrictions of course please substitute as needed but for those who do not have those restrictions, please incorporate a creamy vanilla garnish. For the soup it should be a squash soup. 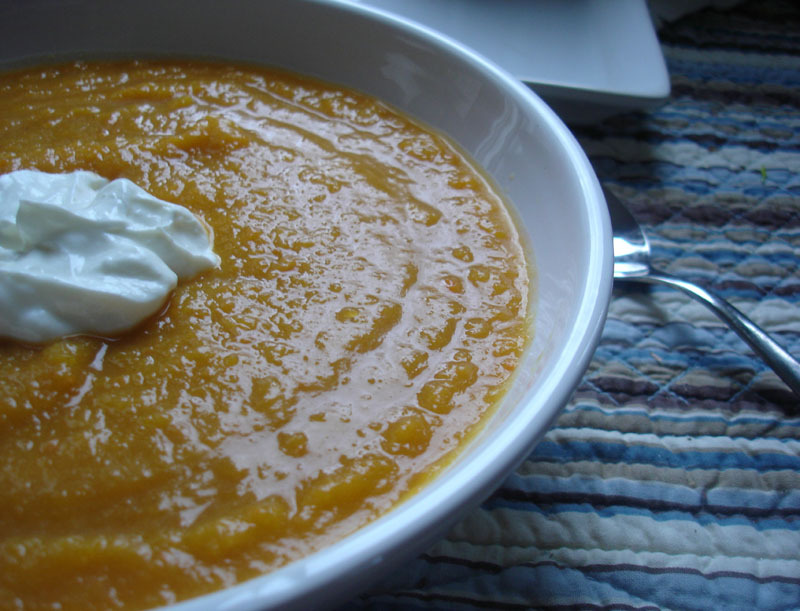 I used a mix of Butternut, buttercup, and acorn squash but you can use your favorites (or what is available). You can pre-cook the squash as well. Whatever you choose to do, please cook your soup with LOVE. Sweat all of the vegetables with butter. Sweat down and deglaze with honey. Stir and add miso. Season with salt and pepper. Cut squash in half, scoop out seeds and reserve one butternut head for garnish. Rub squash with oil and season with salt and pepper. Place one piece of sage under every piece of squash. Place squash face down on a sheet tray and roast at 350 degrees until done. Scoop flesh out and pass through a ricer. Whip creme fraiche and scrape vanilla beans and fold in. Combine squash and vegetable stock to desired consistency. 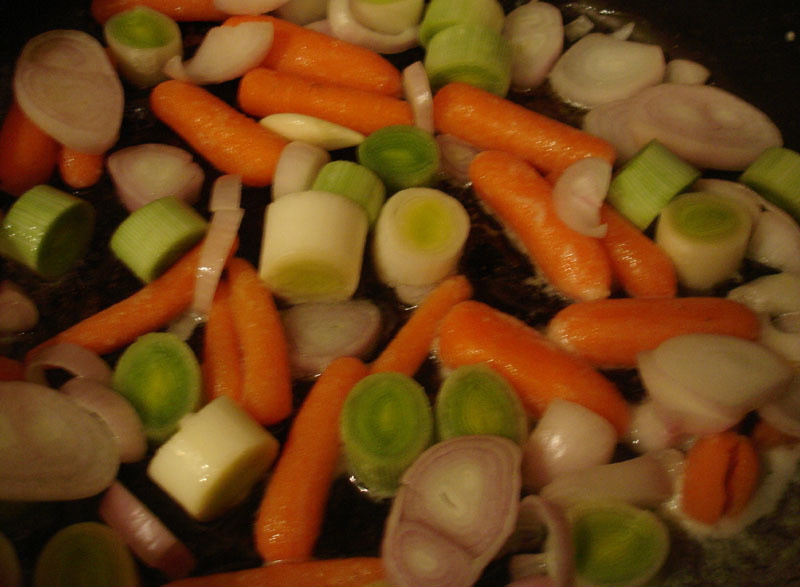 Add mirepoix and cook. Blend with a vita prep and strain through a chinois. Season with salt and cayenne. Add 6 ounces of soup in bowl and spoon in creme fraiche. Garnish with bouquet garnishes.